commented on "LAUNCESTON will have a sea of brown and gold run through it for the last time this year when its adopted Hawthorn clashes with the ..."
LAUNCESTON will have a sea of brown and gold run through it for the last time this year when its adopted Hawthorn clashes with the Western Bulldogs at Aurora Stadium tomorrow. The now-traditional Hawk Walk sees hundreds of people, particularly families, convene at City Park each time Hawthorn plays in Launceston for an 800-metre walk to the football oval in a scene reminiscent of Melbourne on any other game day. The parade is led by the City of Launceston RSL Band and has, at times, recruited dancers and cheerleaders. 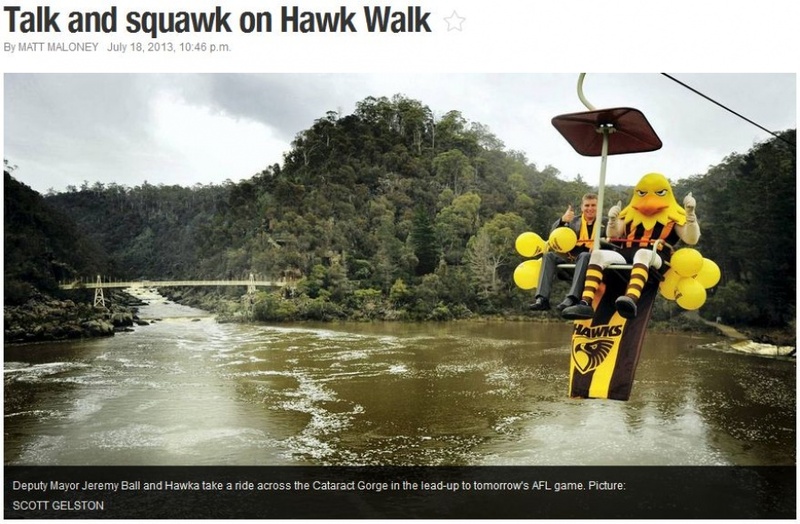 Team mascot Hawka braved the Cataract Gorge chairlift yesterday to promote the event. Event organiser Bree Philpott said the council started the walk to build up a social and family atmosphere before the game. She said families could participate in children's and fitness activities at City Park an hour before walking through the stadium gates. ``Attendance is alway growing and we want to expand the event to include as much activity as we possibly can,'' Ms Philpott said. Launceston acting Mayor Jeremy Ball said the city would be the place to be tomorrow and recommended football fans started their day at the award-winning Harvest Market, and stroll to City Park for pregame relaxation before the two Melbourne sides went to war. ``This is what makes Launceston a family-friendly city,'' Alderman Ball said.